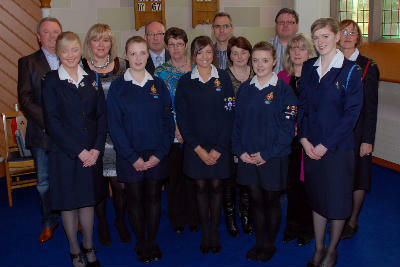 Saturday 2 April saw the Annual Display and presentation of awards of 87th NI Lissara Presbyterian Girls’ Brigade in the Church Hall in Crossgar. Included in the platform party was the Guest of Honour – Mrs Margaret Whyte. Margaret is well known to many in the area and the GB was delighted that she agreed to be the special guest. 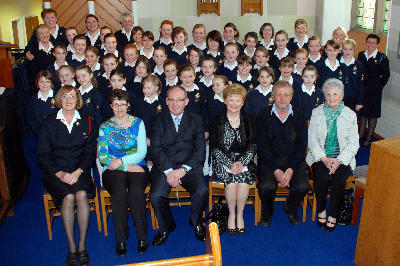 On presenting her report of the year’s activities the Captain, Mrs Elizabeth Patterson, reported that the year had commenced with an enrolment of 93 in the joint Enrolment Service with the Boys’ Brigade in November 2010. The Juniors enjoyed participating in Duster Hockey in Comber, marching in Edengrove, and the team games evening in Killinchy. Over the Christmas period the Juniors visited Glasswater Home and entertained/visited the residents, the Explorers and Tinies had fun, games and presents at their Christmas Party and the Company section had an enjoyable ‘Games for Fun’ Christmas Party with a special Christmas epilogue by our Chaplain, Rev Abraham. The Seniors enjoyed learning and participating in the mini volleyball, an outing to Lazer Quest and McDonalds, and the Senior Worship event held in Carnmoney Presbyterian. One of the highlights of the year was the visit of Sam Shaw and his puppet ministry. 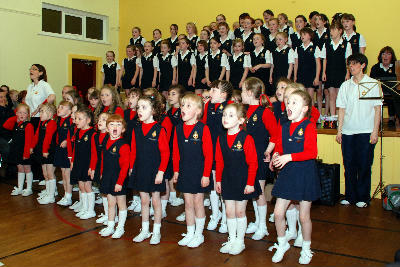 Thanks were also expressed to all parents and friends who joined us for a ‘Hug in a Mug’ evening – raising £305 for NICFC. During the year the Seniors and Brigaders followed the Christianity explored DVD and the Brigaders enjoyed an evening at a Bridal Shop. 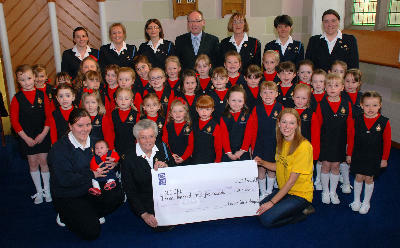 During GB Week, members collected a total of £1,058.75; a very successful camp was held in Kilkeel in August 2010; on Remembrance Sunday a wreath was laid at the War Memorial by 3 senior girls. 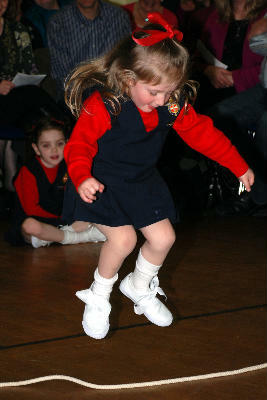 Girls were also reminded that The Annual District Service and Parade will take place in Killinchy on 10 April. Special thanks were expressed to the judges for the PE, Marching and Drill, and to Kate Beattie and the Chaplain for their continued support throughout the session. Thanks were also expressed to all those who helped during the year with specialist badge work - Tanya Dickson (Scrapbooking) , Elizabeth Blakely (Wedding cake decoration), Sarah Kelif (Silk painting), Annahilt Bead Shop (Jewellery making), Richard Gill (Finance issues for Brigaders) and to all the Officers and leaders for their talents, time and patience during the session. We thank God for His blessing on our Company as we continue to “Seek, serve and follow Christ. Two girls Lauren Hamilton and Rebecca Orr, who obtained their Duke of Edinburgh Gold Awards. Nicola McCullough on good performance in Inter-district Brigader solowork. Anna Rea on gaining a 4th place in the District Swimming Competition. Lauren Hamilton and Rebecca Orr on successfully completing Officer training. Pauline Gibson and Rebecca Orr on gaining Mini Volleyball coaching certificates. Laura Gibson with best wishes on her marriage in June to Colin Bonnes. Elizabeth McCorriston (and husband Marcus) on the birth of Lena Jane, and Elizabeth didn’t even miss one Wednesday from GB - how’s that for timing!